Next you want to get all the wires prepared ready for the car. This step does involve soldering, so take all the precautionary measures required to prevent yourself or others from getting injured and make sure you work in a well ventilated area. With the SPP you will have an ASK amplifier in the front that needs an ignition on signal, as will the new radio unit. If you do not have SPP your new radio will still need an ignition on signal, but you won’t need to move the pin in the ISO harness. 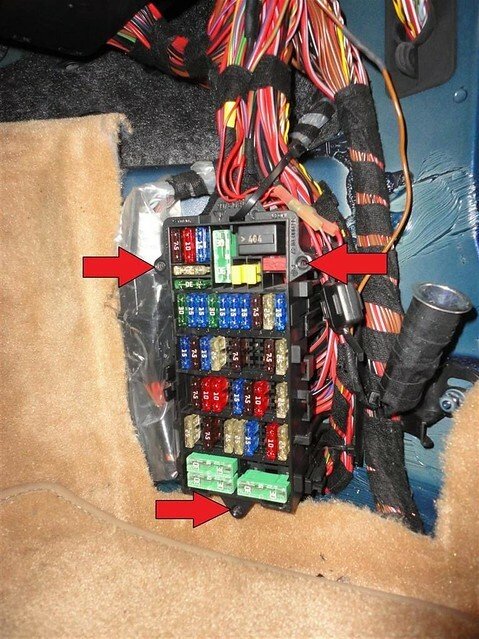 The following is performed on the harness adapter not the car’s harness. Remove Pin 4 from the ISO adapter (red wire) by inserting a small flat blade screwdriver and pushing on the tab that holds the pin in place whilst gently pulling on the red wire. 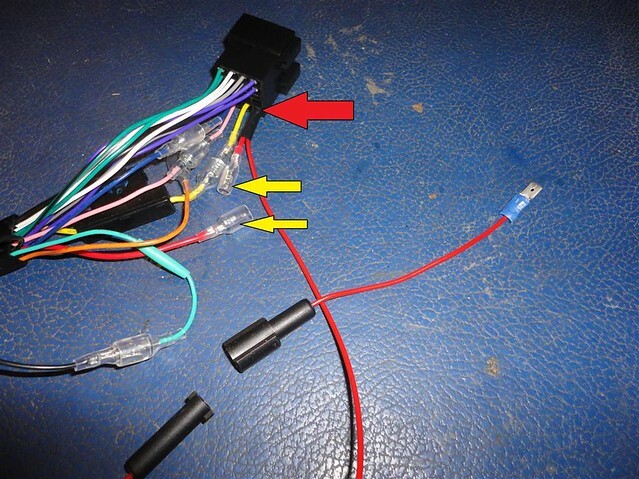 Your red wire may have bullet connectors, if so disconnect them as it makes the next steps easier, if not then it doesn’t matter. 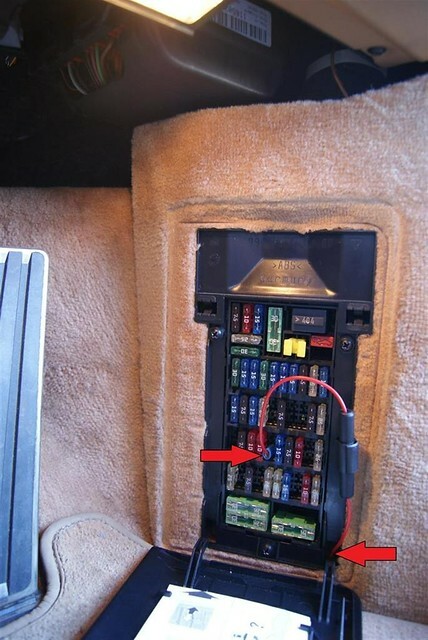 Measure, by dry fitting, your ignition on wire from your radio bay around the drivers foot well to the fuse box (leave some extra as you can tuck it away). Strip some wire and solder one end to the removed ISO adapter Pin (red wire Pin). Once done use some electrical tape to secure the base of the wires together. On the other end strip and solder one half of the fuse holder (the smaller half). 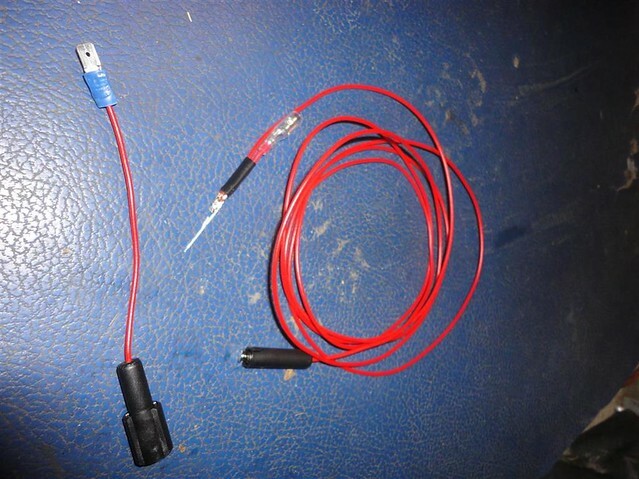 Cut another short length of wire and strip both ends, then solder the other half of the fuse holder to one end (larger half) and crimp the spade connector to the other end. Now you need to put the Pin back into the ISO harness, make sure you put this in to Pin slot 2, which equates to the ASK remote on slot on the car. You can put it back into Pin slot 4 if you have no SPP. If you have the bullet connectors, you can now connect them back up, yellow arrows. The speaker wires are all okay as they are, so no changes required. Check to make sure your new Double DIN radio provides either an aerial out or remote out to Pin slot 5 on the ISO harness, if not move your radio’s aerial power out to Pin slot 5. This is the power on, needed for the car’s powered antenna. 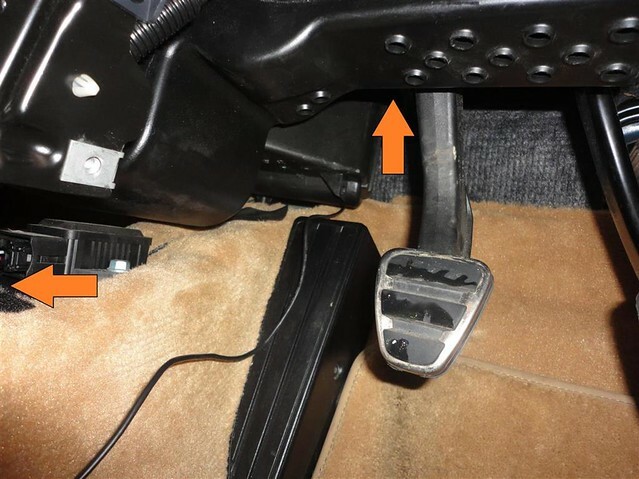 Now route the ignition on wire around the driver’s foot well to the fuse box from the back of the centre console radio bay. Next get all the other ancillary wires into place. This includes any media wires for iPod/iPhone, USB and AUX Jack and the GPS unit. 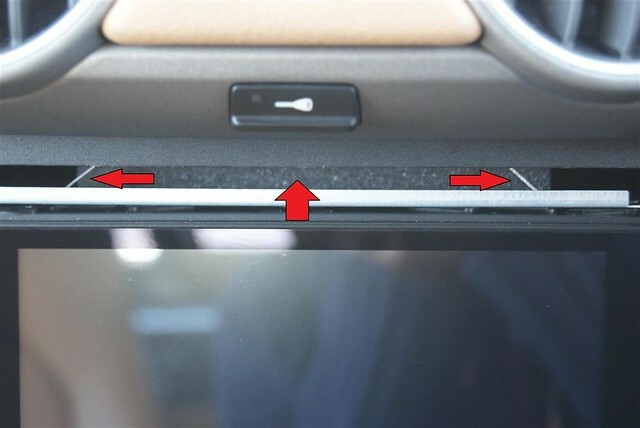 I think the best place for the GPS module is under the black plastic at the base of the window wipers. Open your front boot and remove the battery cover. Now push your GPS wire through the rubber grommet just to the left of the battery, it has an X cut in it. You only need to push a few inches few at first. The red arrow shows the grommet and the orange shows where I placed the GPS module. Stick you GPS module into place. Clean the area with alcohol and use a double sided sticky pad. Now climb into the driver’s foot well and take a look up towards the windscreen near the centre of the console where you might expect the grommet to be (front firewall). Grab the wire and have someone else feed more through as your route it down into the foot well (with one person you can push pull push pull etc...). Route the wire under the carpet and up into the back of the centre console to the radio bay. There are two Velcro tabs holding the carpet in place, simply remove and stick back. Whilst here tuck in your ignition cable up to the fuse box. 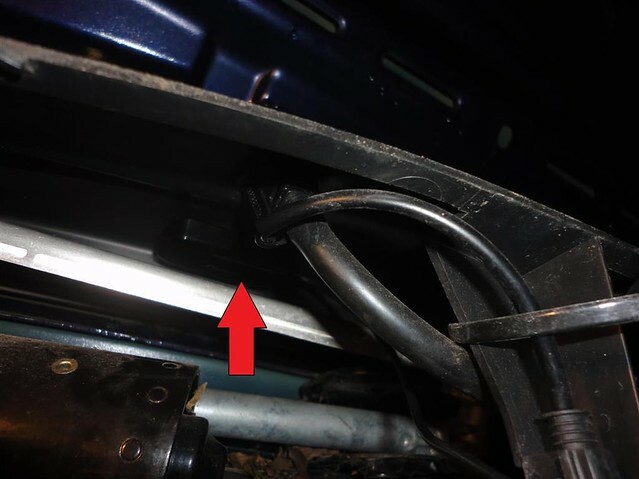 Fit your aerial adapter to the car’s Fakra connector. 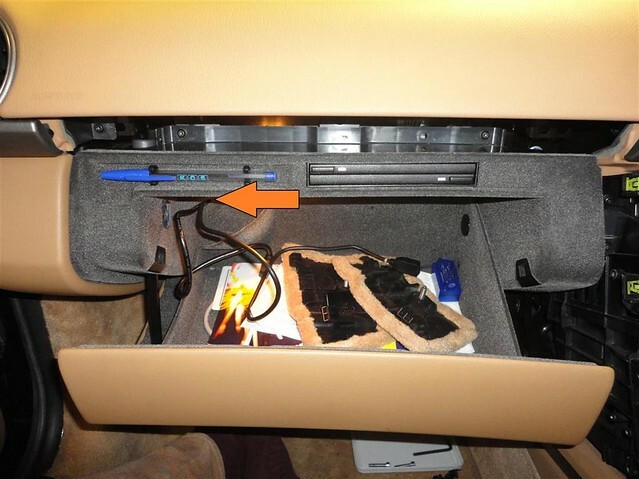 Route your media/iPod/iPhone cables to the glovebox (or elsewhere, see end). 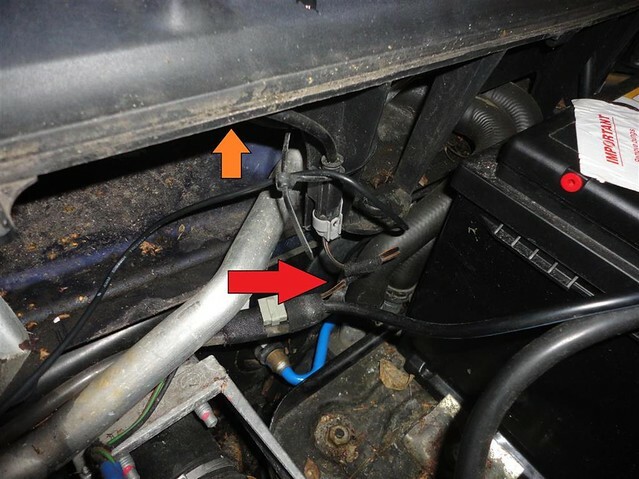 To remove the glovebox in order to install these wires see my How To – Remove 987 Glovebox write up. The last thing is to install the mic. Install this where you like, I chose to have it above the rear view mirror, the wire is routed down the driver’s side pillar. All wires should now be routed. 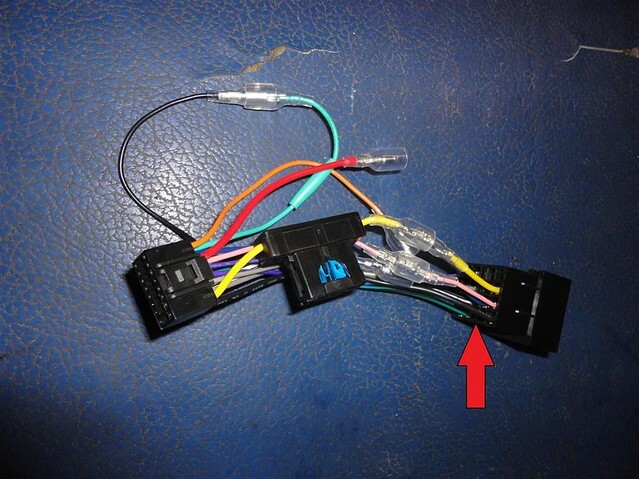 The following picture shows all the existing connectors on the car for information and installation purposes. Tidy up the ignition wire at the fuse box. Remove the fuse box cover and the three screws holding the box in place. The carpet and box should simply pull off (careful near the bottom), you may need to take out your floor mat. Route your ignition wire. Hopefully the small half of your inline fuse holder (from harness) fits through the bottom right slot in the fuse box; push it through from the back. Insert the spade into a vacant fuse slot that would be switched with minimum 5Amp (check your fuse map on the piece of paper on the back of the fuse cover). You can see the one I used. It needs to be the bottom pin of the fuse slot. If the fuse holder doesn’t fit you’ll have to route the spade through the fuse box slot and have the holder behind the carpet. Next, fit the cage that came with the CT23PO03 fascia kit. 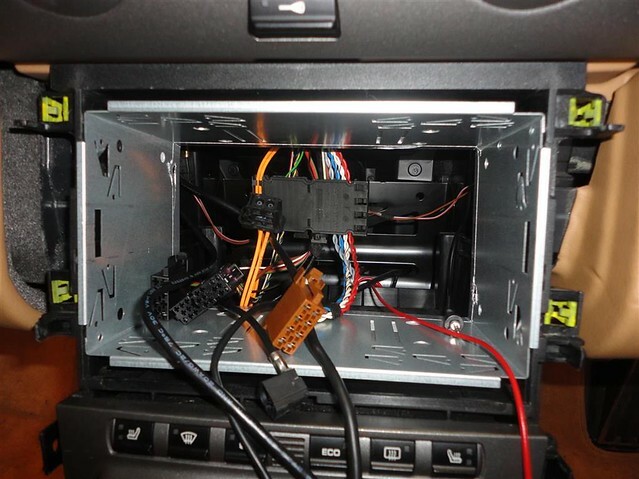 Test fit your radio to see how well it fits and to check the wiring is all okay. The foam pads with the fascia kit are pretty poor at holding the cage in a vertical position; however put one on the top and one on the bottom of the cage, although it should be very tight horizontally. Use a sturdy flat blade screwdriver to push out some of the side prongs of the cage to stop it being pulled out and use two at the top and bottom to act as ‘feet’ to hold the cage vertically in place. Make sure these will not foul the clips on the fascia plate. Test fit the fascia with the radio to make sure it’s all centrally aligned and pad up the bottom of the cage a little to centre the radio in relation to the fascia. This took one or two attempts. I also found that by giving the cage ‘feet’ it and made it more solid and also held the fascia in place better. 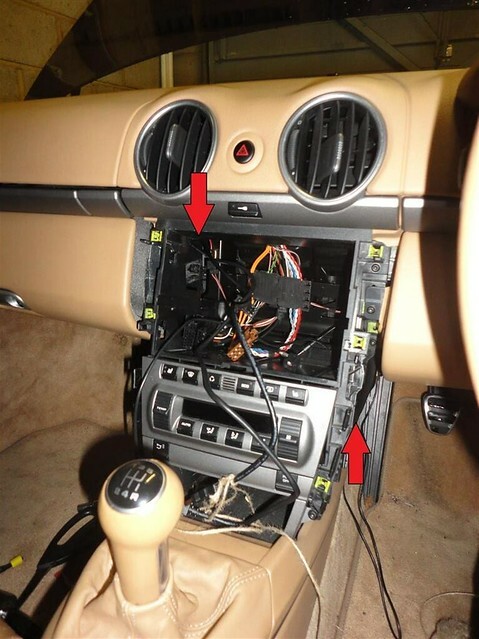 Make sure everything is working as it should, then re-install the side panels to the centre console as well as the back panel pieces. CDR24 pinout as guidance on the 987’s harness, http://www.pelicanparts.com/techarticles/Boxster_Tech/88-ELEC-Radio_Install/CDR_24_Pinout.pdf. Here is a PDF download, Click Here. Great write up . 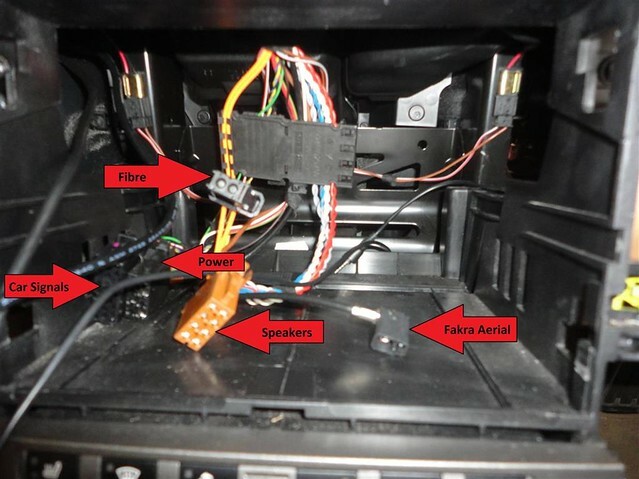 I thought about doing a write up about my install with the Bose system but I my pictures are not as clear as yours. It's a very simple unit requiring only about 6 connections... pity it costs the earth. Interests:All Motor sport, living life to the full. Another + for the "How to" section. On another note .... 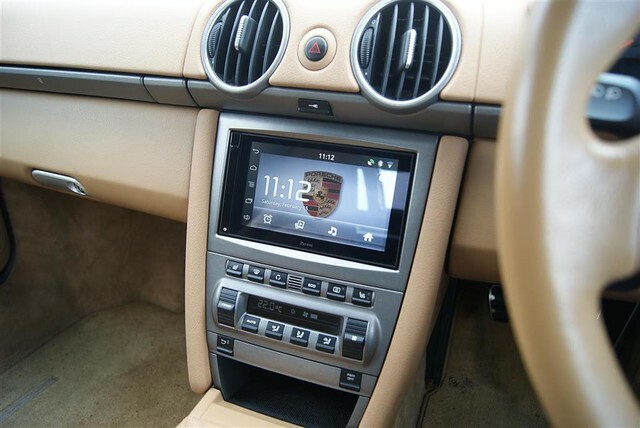 I was just doing some research on that head unit you've got installed ... it looks bloody awesome. An actual decent Android powered head unit from a reputable brand too. Personally, I'd have to root mine and install the actual Google Play store..... check it out! Thanks. Yes, the xda thread is an interestingly long read. I've not rooted mine or attempted google framework etc... At the moment I've stuck with simply sideloading additional Apps I wanted which suits me fine so far. Also check out an App called Asteroid Tweaker, it transforms the smart unit to act more like an integrated car radio system. Great write up which helped me enormously with my install and I also have the Sound Package Plus with Ask amplifier. Also saved me a couple of hundred pounds by being able to buy my Pioneer AV-X5600BT online and avoid fitting charges. 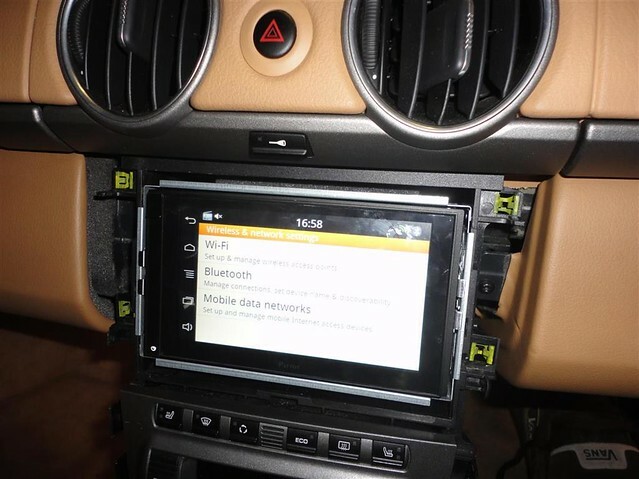 - with the Connects2 double din fitting kit, there is a cage and brackets - are you supposed to use both together which I guess locks the head unit to the cage and provides security against removal? I think I can use the cage only with the 'security' coming from replacing the trim. I don't think you comment on the brackets. - my head unit turns off as soon as I switch my ignition key off, whereas when the CDR24 was installed I think it went off when I removed the key from the ignition (equally it will only turn on when I turn the key to the second position and not just when I put the key in the ignition) - is that the same for you? 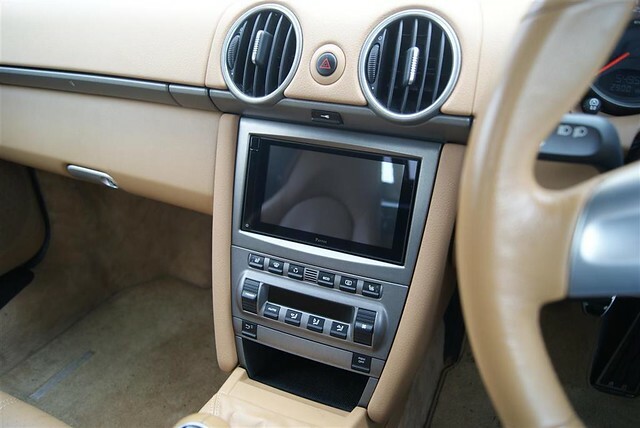 - if by bracket you mean the bronze coloured piece and silver flat piece, you do need to attach that bit to the head unit with the larger flat silver piece holding it in place the bronze piece. One goes on each side of the double DIN unit and you can move the bronze bits in or out to adjust how far the radio secures into/flush with the dash. This will secure the head unit into the cage, you then need to use the keys to get it out. 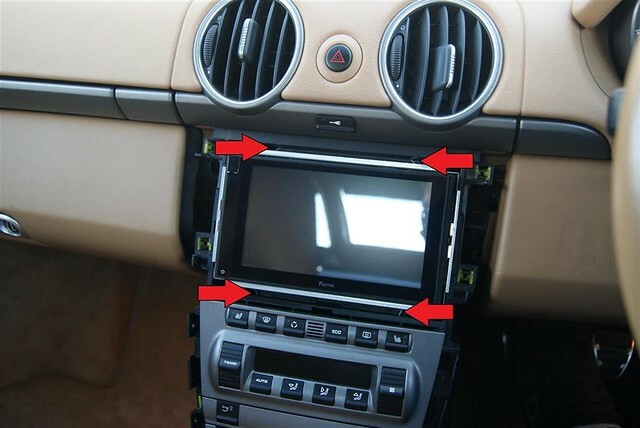 Search google images for 'connects2 double din cage assembly' - image 1 and 3 should show this. - yes this will be the new 'normal operation'. The cdr24 used the plug we left disconnected for trigger events like the on signal (I think it provided a sequence of lower voltage pulses). This meant it could be controlled by the cars systems. Now we are simply using an ignition on +12v feed. I guess you could hook it up to a permanent +12v and have either a separate switch somewhere or have to remember to fully turn off your new radio all the time, else you will have a drained battery. You'll get used to ignition on though. Your link is for an spdif to coax (or vice versa) converter. That will not help you with MOST and the Bose system I'm afraid. 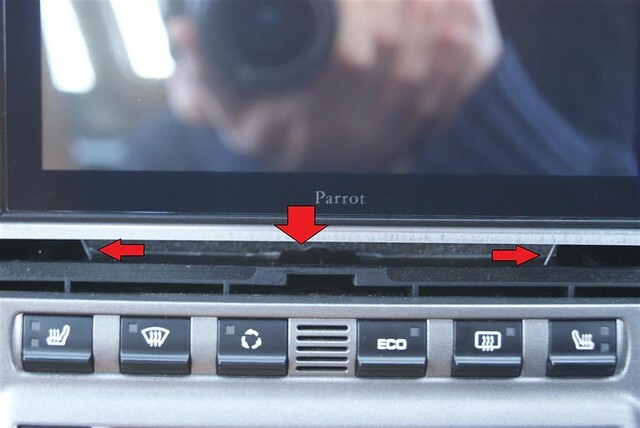 How do you find the screen on the Parrot unit on sunny days? I can hardly see the display on my Pioneer unit. Thinking of ordering some Anti-glare screen protectors for now but not really happy with the unit I've fitted so now concidering the Parrot as a replacement. My Ride:981S, PDK, PASM, PTV and PSE (Willie's!) Abarth 595 Competizione, ST220 and a 1988 Audi 90! I've got a screen protector with some anti glare, I installed before I put the headunit in the car to protect the soft(ish) screen. I read reviews that the reflection was bad though making it difficult to see the screen due to a layer of air between the pixel screen and the touch screen. I've honestly found it okay with the protector on there. If it's dirty with lots of finger marks it is difficult to see when the sun is right on it and behind you with top down, you see lots of smudge reflections, but you can still just make out what is on the screen. If kept clean from finger smudges it's reasonably good at all times. Not sure where you are located Tony, your always welcome a look. I'm up near Blackpool but thanks. Ordered the Anti-glare screen protectors for now. My first attempt was not the best but actually had some manufacturing faults, the company sent me out a new one FOC (from Germany) and my second attempt was more successful, I learned a lot from the first one though so got real lucky at had manufacturing faults in it. That's just in my experience. Thanks again NebOd - I've added the security brackets to the Connects2 cage and the fit is very neat. I have a Pioneer AVH-X5600BT unit and have connected it to my old iPhone 5 via the VGA adaptor. Whilst I'm impressed with the far better sound quality of the Pioneer HU, I'm not that impressed by the 800x480 screen and also find it very hard to see the screen on a sunny day with the roof down. I haven't tried an anti-glare cover yet. I think like many other comments on the web, there is so much more to come with smartphone integration into HU's, and at the moment it's very far from perfect. It's a good HU. I have only side loaded the applications too. I pretty much only use Torque, tom-tom and the music player anyway but I am really happy with it over all. Being able to have 2 phones synch when you enter the car is nice so the better halts phone can still be answered and she can still chat without having to dig her phone out all of the time. The chat clarity is awesome but that's what parrot do well. I also love that I can simply say a group out loud and the head unit plays it. Just a quick update on the Parrot Asteroid Smart install. It's still great and I'm very happy with it! Like epicsnakehips says the call clarity is great and the response to my voice requests to play music albums or artists or call a contact is by far the best system I've used. Using Torque app with a bluetooth OBD reading is working well for when I use it also. The screen is good for the car. I've not had any issues while driving concerning glare (I have a protector fitted). The volume control is also pretty good when in music or calls as you can just swipe the screen to make adjustments. I made no modifications to the Connects2 facia kit, the size was correct for the Parrot unit. Are you fitting the same headunit (parrot asteroid smart)? 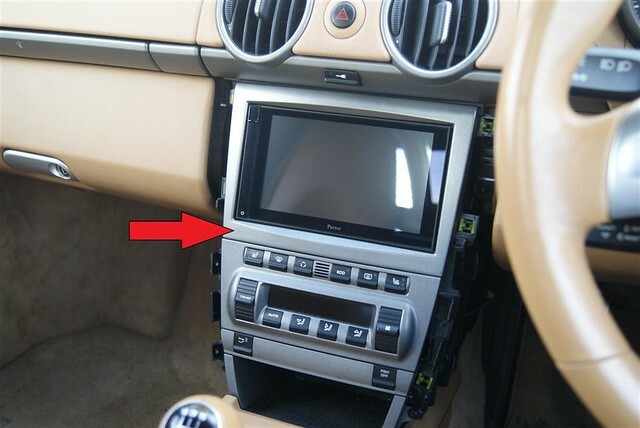 It came with a black surround that can be fitted, however this is not required when using the Connect2 facia, it'll make the headunit too big. Maybe post up a pic? Is the hole in the facia too big or too small? Hi, I'm not fitting a parrot unit - I got one from Avinusa (https://avinusa.com) - which seems similar, but much cheaper as it's being replaced with a version running a later versions of Android (which I don't care about) I've just bought the car so spent everything on that and I'm unwilling to spend another £1000 on the stereo. All the head units seem to have restrictions, the Parrot one being locked to the parrot store, kenwood, alpine etc are seriously expensive and proprietary and limited in terms of the software quality in terms. Anyway, I bought the Connects2 kit and the cutout in the bezel is too small so I've had to modify it with a dremel. It's not perfect yet (I'm tweaking the install a little at a time as I don't want to muck it up!) and I don't think a lot of the connect2 kit itself - fitting a cage with foam is just plain rubbish and a bodge so I'm going to make up some solid (wooden probably) blocks to stand it on ( the unit is fairly heavy and sags at the back, it needs propping up properly). Anyway I just wondered if the cutout was a better fit on other head units as they didn't look to be too consistent in the size of the front bezel - any difference, even 1mm is enought for these to be inconsistent and not fit and I wondered if everyone had the same problem. ... fitting a cage with foam is just plain rubbish and a bodge so I'm going to make up some solid (wooden probably) blocks to stand it on ( the unit is fairly heavy and sags at the back, it needs propping up properly). Good effort Mark. Post up some pics when your done fitting and installing. As I say my connects2 kit fitted fine wrt the hole size. If anything a tiny bit bigger than I'd liek for a proper flush fit. WRT the cage, I also thought the foam was poor so I used the metal push out for feet and secured some to the sides. This works well for me in the end and the cage was solid. Wooden blocks seem like a reasonable idea too. 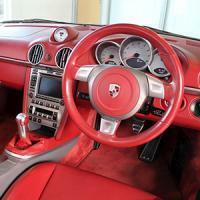 My Ride:Porsche Boxster RS60 Spyder, Merc ML320. I installed my GPS receiver in the same location today. There was no X cut in my grommet though, so I took the grommet out, fed the wire through and then put the grommet back. I was 50:50 on whether to do this or cut a hole in it but decided on this method in the end. Hopefully, my sat nav will be a lot more reliable now, as installing the receiver in the passenger footwell proved a little ropey sometimes (presumably because of all the metal between the footwell and the sky).